225 (Continuing May 1945) June 1945 used at the meetings for children, and also to pay for lots furnished for the meetings. Devotions at this meeting were by Mrs. L. May Fleener who talked about neglected children. the program was presented by Mrs. Stewart. Mrs. Skiles consented to lead the meetings. She expressed the need for helpers. She also said she would need 100 pledge cars, and ribbon for arm bands. the WCTU voted to pay for them. Mrs. McCargar advised we lease it to Mrs. Skiles to get all she needs. Could use $7/70 if needed. Collection at this meeting was $1.70 A potluck picnic was enjoyed by all. Correction: in July! Adjourned Ada Park, Secretary. Corrections to minutes May meeting: it was Mrs. Gregson who furnished the program. At her request, Mrs. Stewart and Miss Sherman read articles. 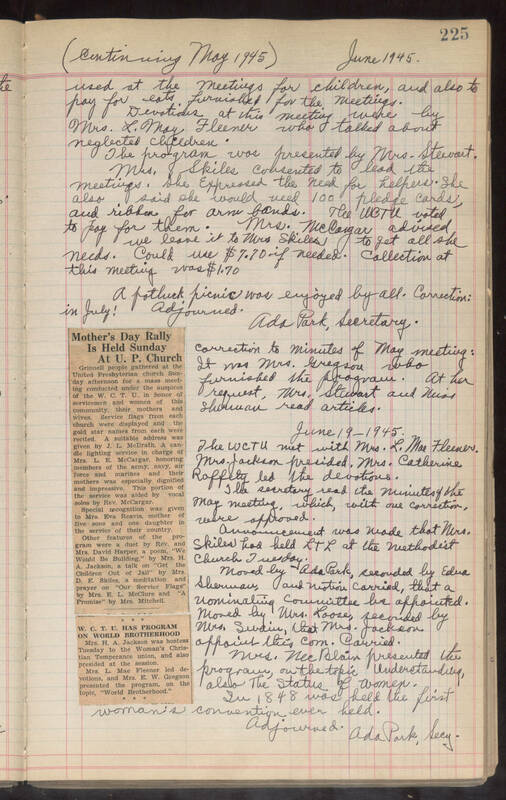 June 19-1945 The WCTU met with Mrs. L. Mae Fleener. Mrs. Jackson resided, Mrs. Catherine Raffety led the devotions. The secretary read the minutes of the May meeting, which, with one correction, were approved. Announcement was made that Mrs. Skiles had held LTL at the Methodist Church Tuesday. Moved by Ada Park, recorded by Edna Sherman, and notion carried, that a nominating committee be appointed. Moved by Mrs. Loose, recorded by Mrs. Swain, that Mrs. Jackson appoint this com. Carried. Mrs. McBlain presented the program, on the topic Understanding, also the Status of Women. In 1848 was held the first woman's convention ever held. Adjourned. Ada Park, Secy. Mother's Day Rally Is Held At U.P. Church Grinnell people gathered at the United Presbyterian church Sunday afternoon for a mass meeting conducted under the auspices of the W.C.T.U. in honor of servicemen and women of this community, their mothers an wives. Service flags from each church were displayed and the gold star names from each were recited. A suitable address was given by J.L. McIlrath. a candle lighting service in the charge of Mrs. L.E. McCargar, honoring members o the army, navy, air force and marines and their mothers was especially dignified and impressive. This portion of the service was aided by vocal solos by Rev. McCargar. Special consideration was given to Mrs. Eva Reavis, mother of five sons and one daughter in the service of their country. Other features of the program were a duet by Rev. and Mrs. David Harper, a poem "We Would Be Building," by Mrs. H.A. Jackson, a talk on "Get The Children Out of Jail" by Mrs. D.E. Skiles, a meditation and prayer on "Our Service Flags" by Mrs. E.L. McClure and "A Promise" by Mrs. Mitchell. W.C.T.U. HAS A PROGRAM ON WORLD BROTHERHOOD Mrs. H.A. Jackson was histess Tuesday to the Woman's Christian Temperance union, and also presided at the session. Mrs. L. Mae Fleener led devotions, and Mrs. E.W. Gregson presented the program on the topic, "World Brotherhood."